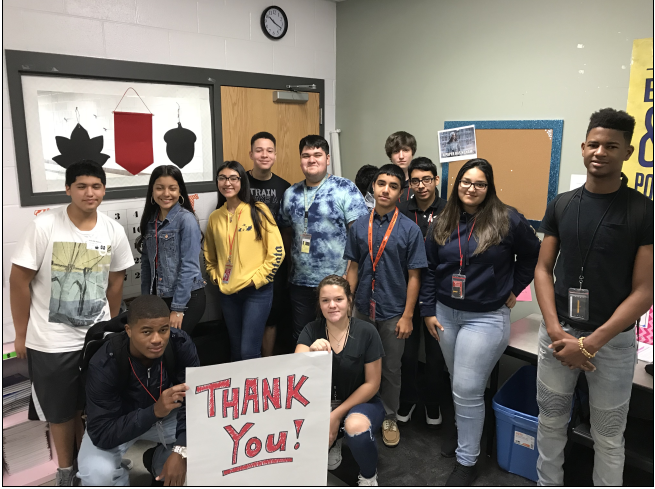 After Hurricane Harvey, the CHS Key Club and Helping Hands Club adopted Ms. Huebner’s 9th grade class at Goose Creek Memorial High School in Baytown, Texas. Together with the help of our students, staff, and community, our clubs were able to raise $3,000! This allowed us to purchase a number of school supplies and other items requested by the teacher. We were also able to purchase a $20 Target gift card for each student in Ms. Huebner’s class. We have received a photo and update from the 9th teacher and students in Texas and thought it would be worth sharing with you. To all of you who supported and/or made a donation to this cause, thank you for your generous support of our project! We are blessed to be part of such a caring and supportive school community. "Mrs. Borden, Thank you for touching base with us! We have had such a busy semester and I know that my kiddos are looking forward to a break! I have included some pictures of my students, who could not be more grateful for all of the incredible donations you guys graciously provided! Just a little update on how we used everything: -We partnered with our school counselors and social worker to put every gift card into the hands of students on our list of students who were displaced or drastically affected by Harvey. This information was collected based on a student survey that was conducted the first day of school. -School supplies have been given out weekly in class and students have been able to gather materials for all of their classes from the donations received. -I also individually conferenced with students in class to allow them to collect any other items that they needed. (Many of our students teared up when they realized that all of those donations were for them! One student even told me that they needed a deodorant for basketball, but was nervous to ask their parents because a $5 deodorant is a lot when your parents are trying to remodel/fix your old house.) -Any other items leftover were given to our school counselor and social worker, who have a room on campus that is managing donations to ensure that all of the donations received school-wide are placed into the hands of students in need. Our Life Skills students help out in this room occasionally so it has been incredible to watch our life skills students help the rest of our student body by assisting them in finding various items in the donation room. -We have also partnered with our Student Council to identify and organize any items that might be a match on our Angel Tree this year- a program that provides Christmas gifts/much needed items to families in need in our feeder pattern. Thank you so much for your generosity and patience! We are planning on taking a big school picture as a thank you, but I am not sure when my principal is going to schedule that photo. Best, Caitlin Huebner"